In 2015, director Denis Villenue released the film Sicario, a crime thriller that presented viewers with an ambiguous tale on the subject of the unspoken war that the U.S. has with the Mexican drug cartels. The film, which featured actress Emily Blunt and actors Josh Brolin and Benicio Del Toro, focus on a FBI agent who gets enlisted by a government covert task force to bring down the leader of a powerful and brutal Mexican drug cartel. 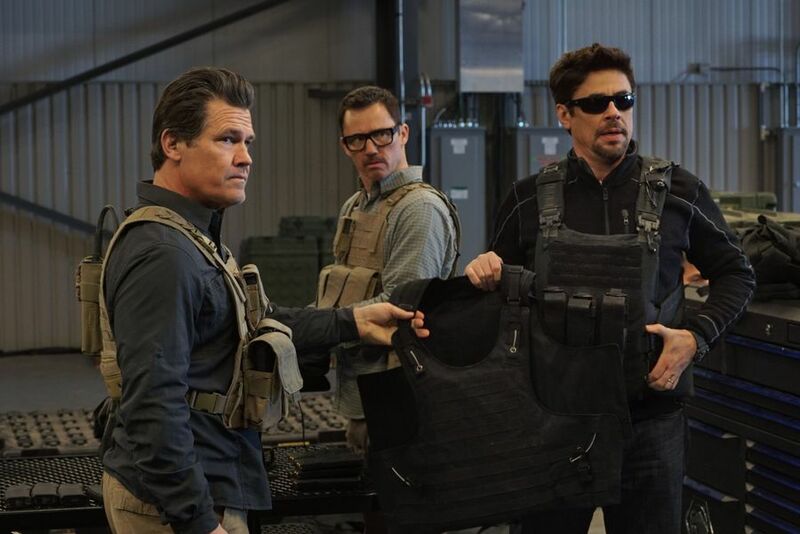 While the movie did receive some criticism, Sicario received mostly positive reviews from moviegoers and critics, with most praising Villenue’s directing for the film as well as screenplay, cinematography, and the trio of actors (Blunt, Brolin, and Del Toro) on their performance in the feature. Sicario was a modest sleeper hit in 2015, collecting roughly $84 million at the box office against its production budge of only $30 million (deemed a success by making two and half times its budget back). Additionally, Sicario went on to be nominated for several awards during the year’s award season, including three nominations at the 88th Academy Awards (Best Cinematography, Best Original Score, and Best Sound Editing) as well as three BAFTA nominations (Best Supporting Actor, Best Cinematography, and Best Film Music). Now, three years have passed since Sicario was released as Columbia Pictures and director Stefano Sollima present the quasi-sequel / spin-off to that 2015 film with the movie Sicario: Day of the Soldado. Does this feature find its gritty and artistic nuances to what made the first film memorable or does it flounder underneath its ambition undertaking? The borders between the U.S. and Mexico has been in constant flux, with the border patrol catching fleeing illegal Mexican immigrants almost on a regular basis. However, after a recent bombing in a Kansas supermarket by Islamic radicals, the U.S. government discovers that the Mexican cartels are smuggling terrorist across the border. Fearing what’s to come and wanting to send a clear message to those responsible for the attack, the CIA reaches out to one of the more seasoned enforcers Matt Graver (Josh Brolin), who has idea for a solution that will require him to conduct some “unsavory” acts (i.e. getting his hand dirty). Seeking to spark a war between the cartels, Matt sets his sights on kidnapping Isabel Reyes (Isabela Moner), the teenaged daughter of the infamous cartel kingpin Carlos Reyes, with the narrative is to blame it on another major cartel and making their interest in ISIS’s agenda. 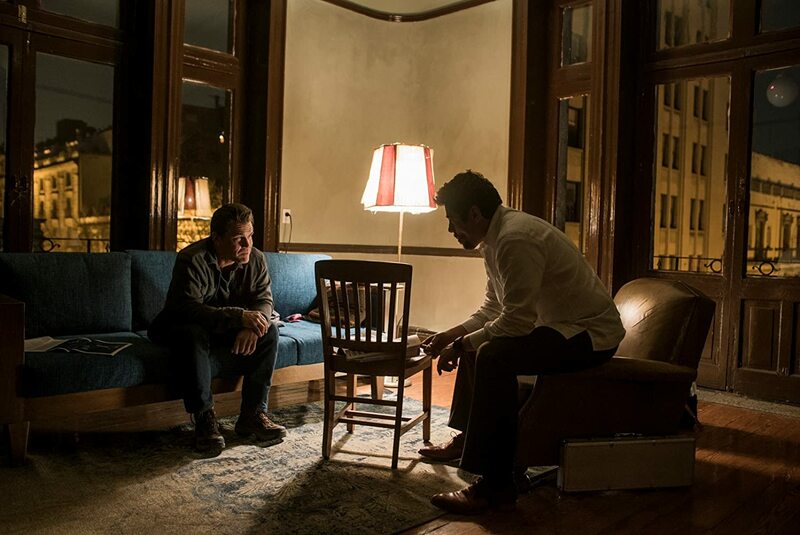 After being greenlit for the covert operation, Matt reaches out to his old pal Alejandro Gillick (Benicio Del Toro), to help him carry out the mission. At first, everything goes according to plan, leaving Isabela clueless about her kidnapper’s true identity. Unfortunately, their mission gets derailed, separating Isabela and Alejandro from Graver and the rest of his team, leaving both men facing tough and difficult decision. Elsewhere, Miguel Hernandez (Elijah Rodriguez), a young Mexican-Latino American teenager, gets indoctrinated into the ruthless cartel system, creating a problem for Matt and Alejandro’s mission. Being a movie buff, I do remember seeing the previews for Sicario when it was released back in 2015 and was somewhat curious to see it when it was theatrically released. However, I had just gotten back from vacation (a week prior to its release) and was already writing movie reviews for Maze Runner: The Scorch Trials, Everest, and The Transporter Refueled and was already planning ahead for other movies I wanted to see in the coming weeks (i.e. The Martian, Pan, and Steve Jobs) Thus, I decided to skip seeing Sicario in theaters. However, I did keep on hearing how good the movie was, so I decided to rent it a few months after Sicario was released on home release. Unfortunately, I didn’t share in much of the positive praise of the movie. I mean…. I found the film to be interesting and I did like Blunt, Brolin, and Del Toro in it as well, but Sicario (to me) wasn’t incredibly awesome as everyone said it was. The pacing was super slow and just did strike much of a “movie experience” chord with me. However, I can see why people liked it, but I just couldn’t find it myself. In the end, I thought that Sicario was just okay (nothing grand, nothing terrible). This brings me back to my review for Sicario: Day of the Soldado. As I said above, I wasn’t exactly super excited with the original Sicario film, but it was a decent film, leaving me with an adequate feeling of being entertained with Villenue’s feature endeavor. That being said, I personally believed that the film was a sort of “one and done” type of movie and really didn’t need to have a sequel. This, of course, made me really think on that idea when I read (online) that Sicario was getting a semi-second installment, with Sicario: Day of the Soldado. I didn’t read much of the “buzz” about the movie online after that until I saw the film’s trailers (I saw them many times when I went to see an R-rated movie at my local theater). To be honest, I wasn’t quite taken the trailers, but was a little intrigued to see if the movie would be better (at least to me) to what the original film was. Thus, I went to see this movie, under the impression of “hoping for the best, but expecting the worst” mindset. So, what did I think of it? Well, to be honest, I actually liked Sicario better. 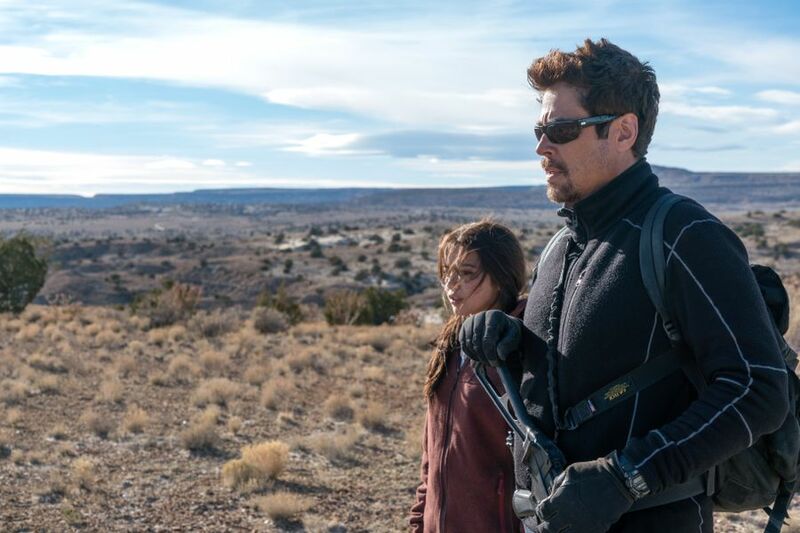 Despite some thematic interjection (both action violence and in some of the performances), Sicario: Day of the Soldado is a very uneven feature that feels a bit lackluster and pointless. The movie gets some things right, but it never really justifies the reason of turning Villenue’s Sicario into a franchise. While Denis Villenue directed the first Sicario film, directorial duties for Day of the Soldado get passed onto by Stefano Sollima, whose previous works includes such projects like Suburra, Gomorrah, A.C.A.B. Much like the first movie, Day of the Soldado weaves elements of the action crime genre tropes with a sort of neo-western and social commentary message that’s centered around the unyielding cycle of violence on the U.S. / Mexico border. Sollima seems to handle the film (in general terms) okay, trying to balance several of the story threads to make a central theme amongst them all. To his credit, he gets it right, but nowhere as near as Villenue was able to create. Given how the narrative plays out, Day of the Soldado is much more ambitious than its predecessor, giving Sollima a bigger sandbox to play around in when helming this project and staging some more gritter and violent action sequences than before (even more so than the first film as well as similar movies out there). Unfortunately, he movie itself just lacks precision and that’s its downfall (more on that below). Additionally, Taylor Sheridan, the only returning filmmaking member from Sicario, returns to his post as the screenwriter, infusing several ideas that feel very “sicario-esque” into this new movie; hoping to capture the same ebb and flow of what made the first film’s story work. To that effect, Sheridan gets it half right, creating a narrative that has all the right components to make for an engaging and entertaining feature film. However, it sort of slowly looses its steam as the film goes on, but I’ll point that out further in the paragraphs below. Still, the themes of both Sicario and Day of the Soldado ring true and do speak to a modern audience, given the subject matter and of the current state that the two nations have with each other over the border. Again, it’s a fundamental topic to discuss and this movie further examines that idea. Speaking on a technical and craftmanship level, Day of the Soldado has an overall solid presentation (as its own movie), but is a stepped down in comparison to the 2015 original film. While the action sequences in the movie are generally good, most of them aren’t quite memorable in terms of design nor staging of events. Cinematographer Dariusz Wolski’s work on the film is commendable, especially the one “shock and awe” sequence that’s in the in the film’s opening salvo that uses good camera work, but the film is just visually less striking that was what presented in the first Sicario feature. You can see the trend I’m going down here. Even the film’s score, which was composed by Hildur Guðnadóttir, gets some stuff right, creating some flourished some great melodic undertones that blend together with the film beautifully. However, some musical notes, just hit a sour note and are more like “moody” music and became a bit annoying at times. Again, I think that composer Jóhann Jóhannsson score for Sicario was better. That being said, the film editing by Matthew Newman and production designs by Kevin Kavanaugh are good in their own right to make them stand out to me. In a nutshell, Day of the Soldado’s presentation is good, but just fails to reach that cinematic touch and theatrical nuances that the first film set the bar for in this franchise. Unfortunately, Day of the Soldado doesn’t quite measure to be all that wants to be, quickly loosing steam and pressure underneath its gritty and violent action piece and thriller aspects. Perhaps the first (and foremost) is the reason of this movie being. There’s technically nothing wrong or offensive about it, but it really begs to question as to why Sicario needed a sequel. The film told a story and was, more or less, a sort of “one and done” endeavor. I guess that studio bigwigs at Sony / Columbia Pictures wanted to create a cinematic franchise out of Sicario and decided to greenlight Day of the Soldado. However, the point of continuing this story feel (in general) really superfluous and doesn’t really warrant a sequel / spin off tale. Thus, the entire movie (from beginning to end) just feels necessary and really doesn’t add much to the original 2015. To be even more honest, I think the movie could’ve been a separate identity (i.e. not tied to the Sicario name) and could’ve been more beneficial to the narrative being told. Yes, they would’ve had to great two new characters to replace Matt and Alejandro, but that would be easy to do. The next big issue that I found with the movie is that it lacks that certain quality that the first Sicario film was able achieve. Yes, as a reminder to you readers, I didn’t find Sicario to be that quite intriguing and gripping as many claimed it to be, but it still had its moments as well as a cohesive storyline and an artistic flourish / nuances from Villenue direction for the project. Day of the Soldado, in comparison, simply just lacks focus and guidance, buckling underneath the ambitious story that Sheridan wants to tell. Without Villenue behind the camera, this movie just falters and feels very haphazard. To be honest, I was a bit confused (during my viewing) at times of what was going on in the narrative. I had a general idea of the plot of the movie (mostly Matt’s mission), but there were a few times that I sort of got lost, which isn’t good thing. To be truthful, the movie is very messy and doesn’t have the proper focus on what it wants to tell. A prime example of this is where the movie beings, setting up Day of the Soldado with a premise of Islamic terrorists, which prompts the U.S. government into action against the Mexican cartels by playing to start a war amongst them. Roughly halfway through the movie, Sollima and Sheridan backtrack on that very same idea and makes their setup narrative of the film utterly pointless and contrived. I was really expecting something completely different than what happened in the second half of the movie and (to be honest) what I was imaging would’ve been better. Day of the Soldado is just a messy undertaking, lacking the proper focus of a narrative that really doesn’t come together, with numerous plot holes and scenario that are odd to be placed in the movie (i.e. Miguel’s story). It’s clear, without Villenue at the helm, Sheridan doesn’t know where to take this Sicario sequel to and just makes it more of a hodgepodge of ideas that he like that ultimately don’t gel together cohesively. Furthermore, the movie is, at various points, a bit boring. Yes, there are flourishes of the brutal violence action (something akin to this film genre), but there are also long periods in the feature that just made me loose interest and further elongate the film (the movie has a runtime of 122 minutes). The third act of the film is where Day of the Soldado looses its punch, dragging on with one particular scene that gets a while for it get going and follow through. It’s a poignant sequence to be sure, but it’s slow and could’ve been bit reduce to make the film’s final cut a bit leaner. Furthermore, the film’s third act seem very inconclusive and incomplete. It’s as if Sheridan ran out of ideas on where to end the film and Sollima just ran with that idea until the film’s ending, capping off the feature with room for a future installment. However, while that tactic has been used for movies before (be it a trilogy or franchise endeavor), Day of the Soldado’s ending just made feel frustrated as it felt me (the viewer) feeling like the story was incomplete and didn’t really resolve that much. It’s almost like movie is part 1 of 2, if you know what I mean, which makes me even more frustrated because we may or may not see the next chapter that would (presumably speaking) end the tale. While I mentioned above that actress Emily Blunt did not return for Day of the Soldado, Sicario’ s other two leads return for the second installment spin-off feature, finding actors Josh Brolin and Benicio Del Toro easily sliding back into their respective roles of Matt Graver and Alejandro Gillick. Given the fact that Blunt’s Kate Macer was the true protagonist in the original Sicario movie, Brolin, known for his roles in Only the Brave, Deadpool 2, and Avengers: Infinity War, and Del Toro, known for his roles in Guardians of the Galaxy, Traffic, and The Usual Suspects, gets more prominent scree-time for their individual characters, showcasing more attributes and character dilemma for both Matt and Alejandro. To their effective, both Brolin and Del Toro are great in their performances and are easily one of the big selling points (at least to me) in Day of the Soldado. Plus, it’s interesting to see where the characters end up at the end of the feature, with a sense of foreboding of what will happen next…. presumably if Sicario 3 does get ever made. As a side-note, while Blunt’s character doesn’t reappear alongside Brolin’s Matt and Del Toro’s Alejandro, actor Jeff Donovan (Burn Notice and J. Edgar) returns to reprise his role of Steve Forsing, a CIA operative in Matt Graver’s team. While he doesn’t have offer that personal screen-time that Brolin and Del Toro have on their respective character, it’s kind of cool to see Donovan’s Forsing return for Day of Soldado, adding that extra continuity between the two films. Of all the new characters in the movie, actress Isabela Moner shines the best in the movie, playing the character of Isabela Moner, Matt and Alejandro’s target for their covert mission. Known for her roles in Transformers: The Last Knight, Growing Up Fisher, and 100 Things to do Before High School), Moner actually does a good job in the role of Isabela, creating a somewhat evolution for her throughout the feature from spoiled and entitled drug cartel kingpin daughter to a frightened girl who, if she wants to live, must learn to trust Alejandro, a complete stranger who might or might not have ulterior motives Although, the character gets a bit of an abrupt ending (more so on the writing and direction of the film rather than Moner). Still, Moner proves to be effective, especially when she’s sharing the screen with Del Toro. The other new character that makes an appearance in the movie is Miguel Hernandez, a wayward youth who finds his way in the employ of being a coyote smuggler of immigrants between the U.S. / Mexico border. Played by actor Elijah Rodriguez (The Book of Life and We Die Young), the character of Miguel shows us (the viewers) how the cartel gangsters can turn an adolescent teen into something dangerous (sort of like how innocence dies within a person). While some of the pieces of Miguel story arc is interesting, majority of his role in the movie is mismanaged. Yes, Rodriguez’s acting is fine in the role, but the character just seems superfluous in the Day of the Soldado storyline. Again, this goes back into my point of the movie interjecting a storyline that doesn’t seem to work, with Miguel’s journey being mostly unnecessary. It’s not really until the last part where his story comes into play with the main narrative thread, but (by then) it’s a bit “too little, too late”. The same thing can be said with the character of Gallo, a minor Mexican gangster kingpin in the cartel organization, who is played by actor Manuel Garcia-Rulfo (The Magnificent Seven and Murder on the Orient Express). While Garcia-Rulfo acting is good (a suitable fit for the character role), the character of Gallo itself is weak and comes off as being undeveloped. Again, this goes back to the idea of that Miguel’s storyline should’ve been “beefed” up or just removed completely from Day of the Soldado (as if for another movie entirely). Rounding out the cast are several other minor supporting characters (some ranging from minor roles to cameo-like appearances). This includes actress Catherine Keener (Get Out and Incredibles 2) as Matt’s CIA superior Cynthia Foards, actor Matthew Modine (47 Meters Down and The Dark Knight Rises) as Secretary of Defense James Riley, actor David Castaneda (The Umbrella Academy and Switched at Birth) as Hector (the person who lures Miguel to work for the cartels), actor Shea Whigham (Boardwalk Empire and Kong: Skull Island) as the shady arms dealer Andy Wheeldon, and Jake Picking (Patriots Day and Blockers) as analyst operative Shawn. While these performances are solid, but some are merely in the background and possibly could’ve been expanded on a few to give the movie a bit more depth (be it character or narrative substance). 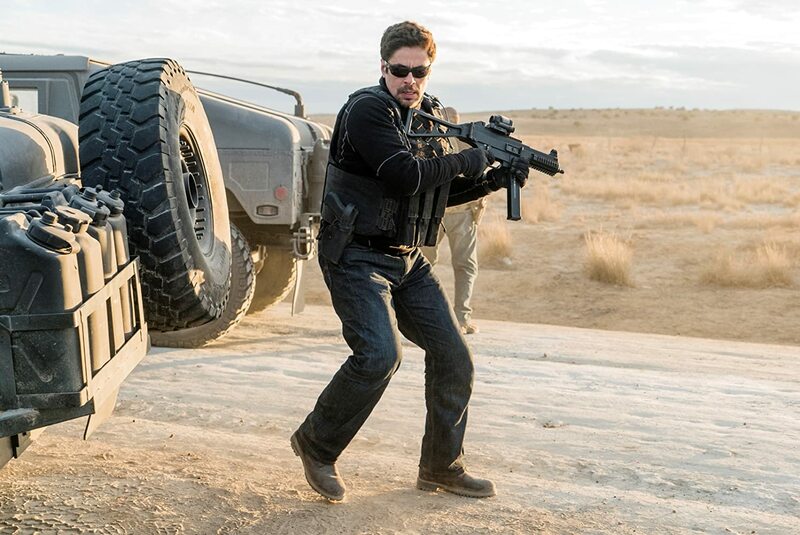 CIA enforcer Matt Graves and sicario operative Alejandro Gillick return to get their “hand dirty” once again for another covert mission in the spin-off sequel film Sicario: Day of the Soldado. Director Stefano Sollima’s latest film sees the return to brutal world of Sicario, unveiling the hidden underworld of the Mexican cartels (and their dealings) as well as some questionable motives that the government must make to ensure safety and secure to its nation. While there’s some creative espionage action violence (some brutal ones to boot, a intrigue yet vague thematic issue of border control between the U.S. and Mexico (an issue that speaks to the modern viewer), and some great performances between Brolin and Del Toro, the movie never rise to challenge, struggling to find a cohesive narrative in amidst a unfocused plot, an uneven pacing, and a film that just failed to make the one fundamental question…. what did this movie need to be made? Personally, I thought this movie was pretty somewhere between adequate and “meh”. There were parts that I liked (something did work great), but the movie itself was unfocused and didn’t lend that much weight to making the movie super engaging or entertaining. Again, it was a movie that didn’t need to be made. Thus, my recommendation for this movie is both a “iffy choice” for those who really crave to see this sequel as well as a more personal and strongly recommended “skip it” for everyone else. As I said, the movie ends more as an opened continuation than a proper conclusion, leaving the idea for a Sicario 3 possible for a future entry. Will that happen? Its unknown, but the reception for Day of the Soldado (so far) doesn’t show a great sign for this potential franchise future forecasting. In the end, however, Sicario: Day of the Soldado just winds up being a pointless and messy sequel. I enjoyed this movie until it hit the point you mention, where it seems they didn’t know how to end it or needed to rush the ending. That part was very disappointing. The upside was Brolin, who in my opinion did an excellent job of portraying his character. Anyone that’s ever been around the guys in baggy slacks and Hawaiian shirts that show up and take over a government operation can attest that Brolin’s demeanor and ends justify the means attitude were point on. If there’s a third I’ll watch it to see what is next. Hopefully though it will be taken up a level and not go down one as this movie did. I gotta admit I loved this movie. The first film was one of my favorites of 2015. I was nervous about this one with so many talented people not returning. But it really surprised me and kept me glued for the duration.